The market started the week at SPX 2391. The market rose on Monday, hit an all-time high on Tuesday at SPX 2406, then started to pullback. On Wednesday the market had a gap down opening, hit SPX 2353 on Thursday, then rallied to end the week at 2382. For the week the SPX/DOW lost 0.40%, and the NDX/NAZ lost 0.60%. Economic reports were mostly positive. On the downtick: the NY FED, housing starts, building permits, and the WLEI. On the uptick: the Philly FED, the NAHB, industrial production, capacity utilization, leading indicators, the Q2 GDP estimate, plus weekly jobless claims declined. Next week’s reports will be highlighted by: Q1 GDP, durable goods, FOMC minutes, and housing. It’s a bull market. 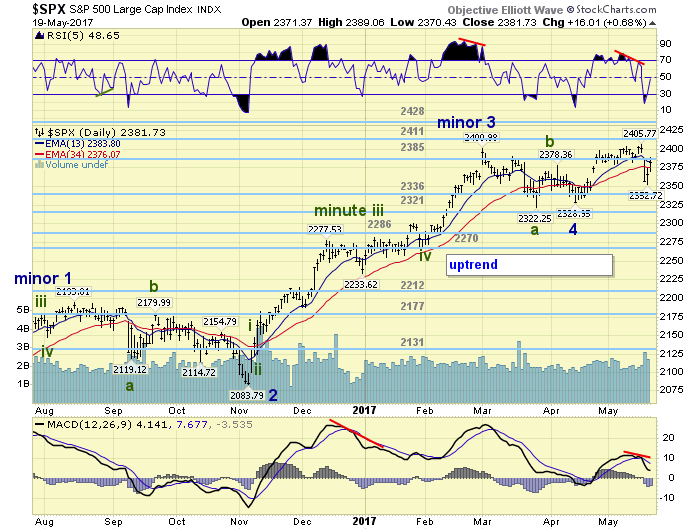 For the past several months, however, the SPX 2400 level has offered stiff resistance. Maybe it is the high multiple valuations. Maybe it is the failure to get any of the promised economic policies passed. Maybe it is the FED raising rates and suggesting they are ready to start winding down their balance sheet. Maybe it is a combination of all three, and others. Whatever the reason the SPX has managed to add only 5 points to the 2401 all-time high since March 1st. The long-term count remains unchanged. Intermediate waves i and ii ended in the spring of 2016. Minor waves 1 and 2, of Int. iii, ended in the fall of 2016. Minor waves 3 and 4, of Int. iii, ended in the spring of 2017. 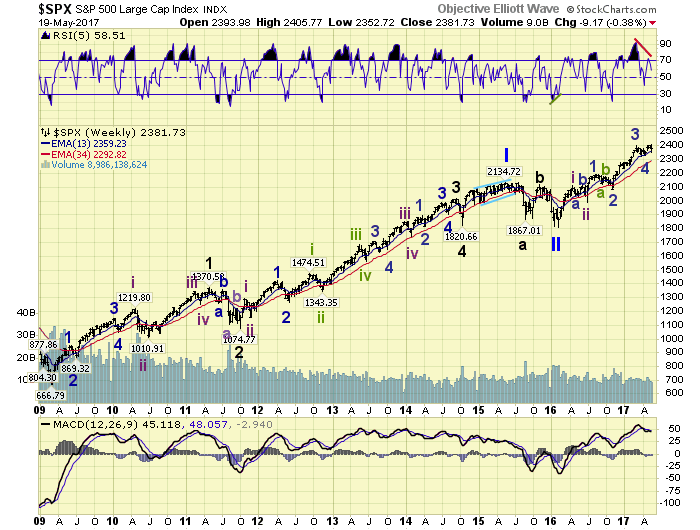 And Minor wave 5 is currently underway, or has topped recently at SPX 2406. The key to that decision point depends on the performance of the DOW and NAZ in the coming days/weeks. The Minor wave 5 uptrend began with a Minor wave 4 failed flat in April: wave a 2322 and wave c 2329. From that low the market has rallied in five waves, confirmed by two different timeframes, to SPX 2406. While the uptrend is not even 100 points, there is some concern that it may have ended as another weak fifth wave. Especially after the recent mid-week 50+ point decline. We have labeled the SPX 2406 high as either the end of Minor 5 or only the end of Minute i of Minor 5, (see hourly chart). The key to this determination appears to be the NAZ and the DOW. The NAZ is currently in Minor wave 5 of Int. iii as well. It should make new highs in the coming days/weeks. The rally in this sector should keep the general market rising at least until that is accomplished. The DOW, also in Minor 5, has been quite weak and has yet to exceed its March 1st high. 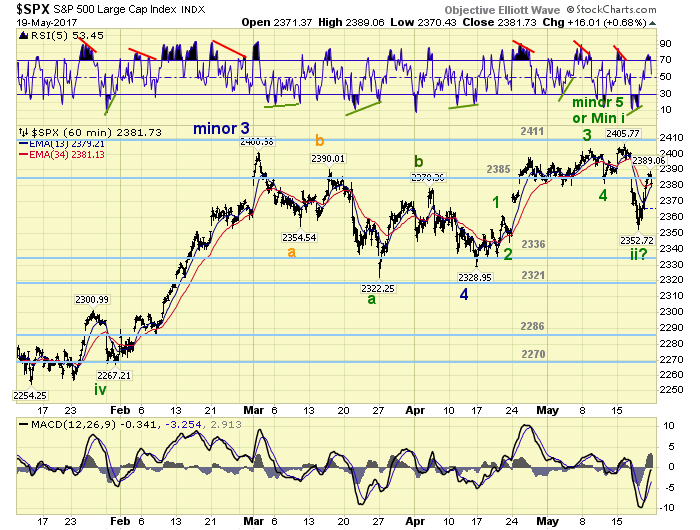 This suggests it may have only completed Minute waves i and ii of its Minor 5, similar to the potential SPX count. In order to keep the uptrend going the DOW has to start to outperform on a relative basis, and carry the SPX with it, while the NDX/NAZ are rising. Failure to do so suggests only a marginal new high in the NDX/NAZ to complete their uptrend. Then all four indices would enter an Intermediate wave iv downtrend. Suggest keeping an eye on the DOW and the NAZ (high 6170) next week. Medium term support is at the 2336 and 2321 pivots, with resistance at the 2385 and 2411 pivots. With the five waves up completed at SPX 2406 this week, the market declined about 61.8% of that advance to SPX 2353 on Thursday. Then the market started to rebound. If the five waves up and subsequent decline were only Minute waves i and ii of Minor 5, then the DOW should start rallying/outperforming on its way to new highs. If it doesn’t, SPX 2406 could be the high of Minor 5/Intermediate iii, leading to a 5% to 6% decline for Intermediate wave iv downtrend that follows. If the market does rollover into a downtrend. Then support for the SPX should appear around the OEW 2270 pivot, and around 5800 in the NAZ. Daily and weekly RSI/MACD indicators are displaying negative divergences at the recent highs, supporting the potential upcoming downtrend scenario. Short term support is at SPX 2353 and the 2336 pivot, with resistance at the 2385 and 2411 pivots. Short term momentum ended the week declining from overbought. Best to your trading! Asian markets were mixed and lost 0.6%. The DJ World index gained 0.1%, and the NYSE was flat. Bonds are trying to uptrend and gained 0.6%. Crude is trying to uptrend and gained 5.9%. Gold is also trying to uptrend and gained 2.1%. The USD remains in a downtrend and lost 1.4%. Tuesday: new home sales. Wednesday: existing home sales, the FHFA index and the FOMC minutes. Thursday: weekly jobless claims. Friday: Q1 GDP, durable goods and consumer sentiment.